By Chris Williams: It’s tough to put together a fight between Manny Pacquiao and Floyd Mayweather Jr. when Pacquiao’s promoter Bob Arum has never been too enthralled with matching his cash cow with Mayweather in the first place. Arum comes out and admits that his reluctance to put the fight together but saying it was because of some of the hurtful things Mayweather would say about Pacquiao rather than Arum worrying about his gravy train fighter Pacquiao getting dominated by the highly skilled Mayweather. As you know once Pacquiao gets destroyed by Mayweather, Pacquiao’s earning potential will likely take a huge drop. This could be one of the reasons why Arum hasn’t been so eager to put Pacquiao in with Floyd. I don’t buy it. I think Arum is more afraid of not what Mayweather is going to say about Pacquiao but more so what he would likely do to the small Filipino. We saw Mayweather dominated Juan Manuel Marquez two years ago, winning every round of a 12 round fight. This is the same Marquez that Pacquiao went life and death with twice and won a controversial 12 round decision against in 2008. A lot of boxing fans think Marquez should have won both fights with Pacquiao, as do I. This weekend Pacquiao faces Marquez for the third time and it’s likely going to be another very, very tough fight for Pacquiao. I think Marquez might even win, which will pretty much put to finish the dream of a mega fight between Pacquiao and Mayweather. I see Arum as being worried about not the insults Mayweather will be slinging at Arum’s fighter Pacquiao, but rather the beating he would give him. Mayweather is already insulting Pacquiao even without fighting. 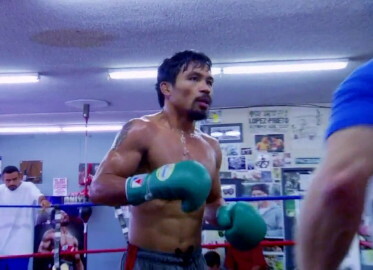 What difference would there be if Pacquiao were to fight him? He’d get just as much insulted as he is now, only Mayweather would obviously make Pacquiao look bad in their one on one meetings due to his ability to trash talk. The press conferences would be one-sided with Mayweather dominating a likely shy and ill at ease Pacquiao, who wouldn’t want to get in the gutter and start trash talking back. I think Mayweather would end up doing the brunt of the promoting for the fight with his charisma and ability to give excellent sound bites. The biggest reason I think Arum doesn’t want to match Pacquiao up with Mayweather is because one Pacquiao gets schooled by Mayweather, it would likely leave Mayweather at the top and Pacquiao a distant second in future pay per view fights. Who would want to pay $55 to see Pacquiao fight after he gets wiped out by Mayweather and loses his WBO welterweight title? I know I wouldn’t. I don’t care if Pacquiao quickly picks up a paper title against one of the weak welterweight champions in the division, he’d still have been beaten by Mayweather and I wouldn’t see Pacquiao as a PPV star any longer. I barely see him as one now because of all the easy catchweight fights he’s been put in during the past couple of years.